Well guess what, folks, it looks like my wish has been granted thanks to the crafty creations of Rabbit Smile. Yippee! 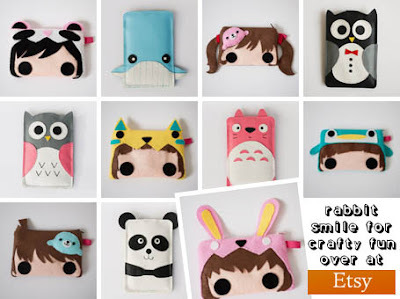 Rabbit Smile is an Etsy shop that sells hand crafted gadget cases for cute technology fans everywhere. So if you’ve ever wished your iPhone or iPod looked sweeter, then these are the guys to help. And they even sell key chains, scarves, and finger puppets too! 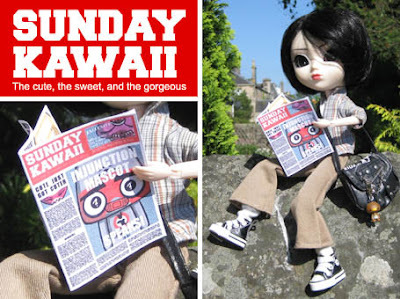 Yip, it’s a brand new Sunday paper called the Sunday Kawaii! I reckon it could be a big seller, and what’s more I reckon you and your crack team of kawaii mascots would be the ideal team to run it. After all, your blog already has horoscopes, puzzles, shopping tips, and even an advice column! In fact, the only thing that’s missing is the news and celebrity gossip, and even a monkey could make that stuff up! After all, it’s not rocket science! 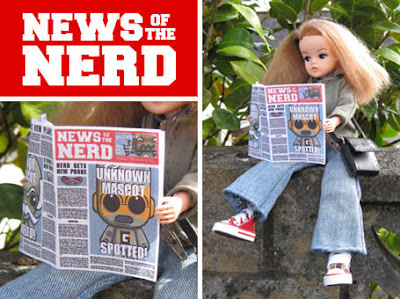 Unless it’s news about rocket science, obviously! Anyway, whadya think? Hmmm? An interesting idea, Cornelius, and one that I wholly agree would be an undoubted success with me at the helm. Unfortunately, however, my commitments to my loyal readers right here have to come first! And also, isn’t running a paper a lot of hard work? See what I mean? The incredibly cool work you are looking at above is that of illustrator Wardell Brown. 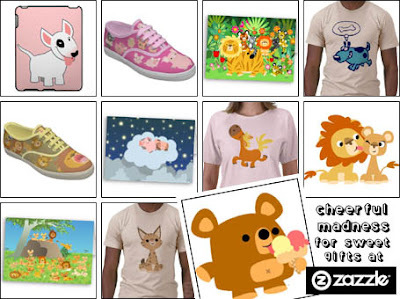 And at the Wardell Brown Zazzle store you can pick yourself up some of those self same works on t-shirts, iPhone cases, posters, postcards, and more. And, even better still, in the process of doing so you’ll undoubtedly make yourself a little bit cooler too! Everyone’s a winner! A couple of years ago I wrote to your big haired, big flared colleague the Disco Mascot to get some expert advice on the 1970s. (Re. Stuck in the Seventies!) The reason for seeking that advice was so I could teach my pupils all about that particular decade - I’m a teacher, in case you haven’t guessed! Anyway, as I’m always looking for new and exciting ways to keep my kids learning, I’ve decided this year I’ll tell them all about the 1980s! Think you could help me rad up my classroom to the max? 1. Look sharp! Dig out some bodaciously cool threads to set the eighties scene! Day-glo lycra and lace for the girls, and pastel suits for the boys! Mondo! 2. Word up! Don’t just dress the part, speak the part too! The English language was at its most righteous in the 1980s! 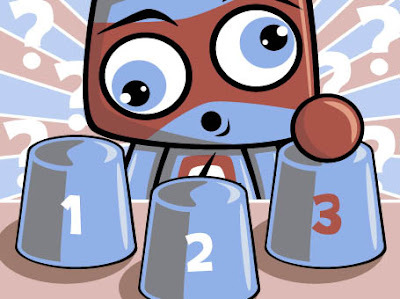 Give your pupils the 411 and they’ll be amped! 3. Make a montage! Montages were mega back in the day! Why not get your pupils to make montages of their summer holidays? That would be so dyno! 4. Have brunch! By the time the 80s rolled around, three meals a day were no longer enough! Amaze your class by announcing this extra daily meal! Sweet! Tight! So there you are, Miss Henderson, everything you’ll ever need for bringing the 1980s back to life! Although, given the current financial climate, I’d say most of the hard work’s already been done for you! Fresh! I not usually one to follow the news or current affairs or any of that nonsense, but recently I’ve found it annoyingly unavoidable! It seems that lately all anyone wants to talk about is journalists, politicians, and policemen, and who they know, and what they know, and how they know it, and where they go for dinner, and when all of this happened, etc. etc. etc. And it doesn’t look like it’s about to stop anytime soon! Anyway, as the old saying goes, if you can’t beat them join them! 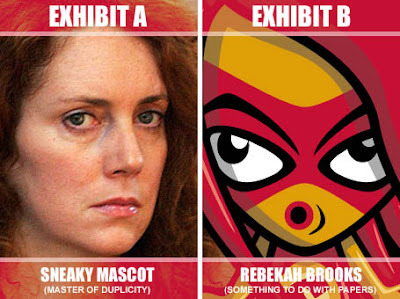 So here’s my own contribution to this ongoing debacle… don’t you think you and Rebekah Brooks look alike? OK, I’ll admit it’s probably not the most enlightening contribution to this scandal, and I don’t reckon the editor of the Guardian will be knocking on my door any time soon looking to hire me, but I do think it’s a question worth asking. After all, it seems that most people believe she looks like Simply Red singer Mick Hucknall, which I think is an absurd suggestion! I mean, when’s the last time you saw Mick Hucknall in a skirt? Absolutely ludicrous! Anyway, just though I’d get in touch and see what you think? Wow! Just when I thought our readers couldn’t get any odder, along comes Robert with this biscuit taking corker! What do I think? I think I may have to change my name to the Dumbstruck Mascot! That’s what I think! Although I did like the way you mixed up the captions for the Brookster and myself - very sneaky indeed! Gorgeous, isn’t it? 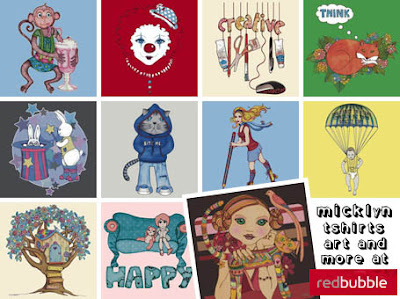 What you are looking at above are just some of the wonderful designs and illustrations from the amazing Sandygrafik store. 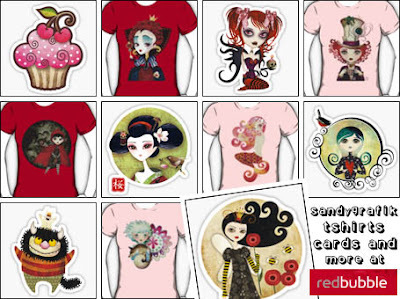 The store sells t-shirts, prints, cards, and stickers, and every one of them is as beautiful and creative as the next. It’s even got designs inspired by Alice in Wonderland and the Wizard of Oz. So what are you waiting for? 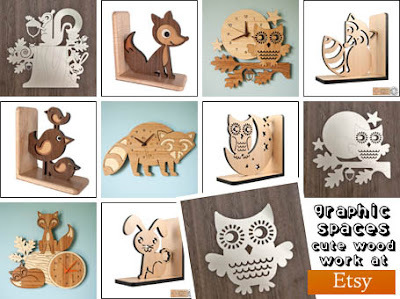 Head on over to Sandygrafik and fall in love right now!